On November 22, 1963, three shots rang out in Dallas, President Kennedy died, and the world changed forever. If you had the chance to change the course of history, would you? Would the consequences be worth it? Jake Epping is a thirty-five-year-old high school English teacher in Lisbon Falls, Maine, who makes extra money teaching adults in the GED program. He receives an essay from one of the students—a gruesome, harrowing first person story about the night 50 years ago when Harry Dunning’s father came home and killed his mother, his sister, and his brother with a hammer. Harry escaped with a smashed leg, as evidenced by his crooked walk. Not much later, Jake’s friend Al, who runs the local diner, divulges a secret: his storeroom is a portal to 1958. He enlists Jake on an insane—and insanely possible—mission to try to prevent the Kennedy assassination. So begins Jake’s new life as George Amberson and his new world of Elvis and JFK, of big American cars and sock hops, of a troubled loner named Lee Harvey Oswald and a beautiful high school librarian named Sadie Dunhill, who becomes the love of Jake’s life—a life that transgresses all the normal rules of time. This was my introduction to Stephen King and I wasn't sure what to expect. He's certainly been at the forefront of the literary world for quite sometime, but considering that some of the other authors who regularly make the bestsellers list over and over rub me the wrong way, I didn't know if I'd be sold. 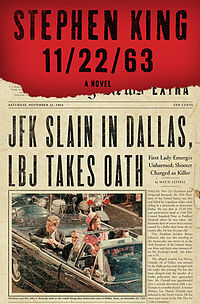 Turns out, the guy is brilliant; 11/22/63 was freaking awesome. The only thing I knew about this novel before I started it was that 1. it made the New York Times Ten Best Books of 2011 list and 2. it was about a man who traveled back in time in attempt to stop the assassination of JFK. 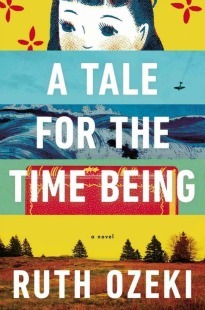 Part of the delight of reading this book, for me, were the surprises of our main character's journey itself, not knowing what would happen next, and the nuances of King's version of time travel. Keeping this idea in mind, I am going to refrain from giving too much away in this review. The premise of the novel is what initially drew me to this book, but in the end the reasons I adored it so much was not because it was a time travel novel (I'm a serious sucker for those) but because it was truly moving and really made me think. The idea that "the past is obdurate" gives Jake all sorts of problems when he travels back in time, as if he has to work against the universe itself to change the past. And then there is the question of the butterfly effect; by changing something in the past what will you alter in the future? Ultimately, does one's manipulation of the future prove to be worth it after its ramifications surface? How tightly are the past the present woven together and is there truly a destiny for each of us? Though the novel takes place in two different decades there are universal ideas that doesn't change over time, namely love, loss, trust and nostalgia. I enjoyed my time in the "land of ago," a time before cell phones and internet, when the soda tasted sweeter and the pies were creamier. The novel as a whole is well researched masterfully plotted. The end notes are worth reading as well. Here King explains that he started to write this novel in the 70's but set it aside after deciding it was "too soon" after JFK's assassination, choosing to return to the novel after his career was more established. He also touches on the fact that it was never 100% proven Lee Harvey Oswald was the one who killed JFK - many speculate he didn't work alone, or that he didn't have anything to do with it at all. King spent plenty of time researching these claims, citing what he believed are the most noteworthy books about the subject. After years of research, King claims he is 98% certain, sometimes 99%, that Oswald was the one who did it. One other thing I want to metion - if you are put off by this book because of it's length, don't be. I can honestly say this novel does not feel as long as the pages it holds (849) and by the time you finish you will wish it was longer because you don't want it to be over. It has taken me longer to read a slow 300 page novel than it did for me to finish King's tome. If you are interested in the novel, just pick it up and forget its length! This book is nothing short of incredible. A big thanks to my sister who gifted this book to me for Christmas. Interesting. I read a lot of King's stuff in high school (mostly because my mom didn't think it was appropriate) but not much since. I've seen this everywhere but never really gave it much thought. It sounds quite intriguing though. Might be time to pick up another King book. What is one of your favorite Kings that you've read? I've read so many great reviews of this book. I really should just break down and read it. Your review definitely makes it sound quite enticing! I'm really excited to read this one, I just need to find the time since it's such a huge book! I'm so glad you enjoyed this, I've been a fan of Stephen King for awhile (mainly because my sister has collected all his books). But this one definitely caught my attention that I had to have it for myself. I think if you find the time, you'll find you read it faster than you first thought. I was worried about its length too, and it turned out to move quite quickly. So glad you liked it. I loved his time in "the land of ago". I know there are complaints about the tangent away from the main story but these were my favorite parts and I would get (mildly) disappointed when he started tracking Oswald again. I was not ready for it to be over when I got to the end, no matter how many pages may have come before that. Nice review! Red I totally agree! I thought the way King worked up to the Oswald story line was brilliant and among my favorite parts of the book. It really made me more invested in Jake's overall goal to change the past for the better. I wanted to see him succeed. I also thought it worked to establish King's "rules" of time travel - just exactly how everything worked in the past with regard to money, the resets, bringing things back and the ramifications of it all. Glad you liked it, too - you already know I loved it. It's just a great novel! You know what it wasn't until you mentioned what a low-ball comment that was did I laugh. That is pretty funny! Very nice review, Brenna. It's a huge engagement to read such a long book, but knowing King from experience, longer usually means better. BAG OF BONES and DREAMCATCHER were terrific, despite being about ghosts and aliens. SALEM was also one of the last convincing vampire stories. I'm thinking of picking this one up for my vacation this year. That or Hitchens' ARGUABLY. Thanks, Ben! I'm really interested in reading some more of his stuff. I've heard great things about the Dark Tower trilogy. Have you read that? I enjoyed reading your review, Brenna. I am not a big fan of Stephen King so it was the premise that lured me to this book. And boy am I glad. It really is a fabulous tale. The pages just fly by. Brenna! I've been patiently awaiting your review and am so glad I decided to pick it up! I'm sure there's no way I'll come close to touching this review, but I'm really looking forward to sharing after I finally do take the plunge. This will be my first King, and I'll admit that I've always been somewhat disinterested in his work, so I'll have you to thank if I actually complete it. Great review-- you can really tell you loved it! i agree that this book was not that long after all. A very addictive read. Sounds great! Haven't read King since college, but have a sample of this one downloaded on my new Nook. I think time travel is a departure for him.... I remember his older books being pretty scary. I used to follow his books faithfully; I remember travelling in the U.S. at some point and being over-the-top-thrilled to be able to snag a copy of the paperback of It before it had been released in Canada. I think the way that he combines character development with pacing is tremendously skillful and I haven't seen any change in that over the arc of books that I've read; my sense is that people have favourites because there are stories that they like more and characters they like more (because of course there is a wide variety across so many novels and shorter works), rather than any marked difference in quality, IMO. Having just picked up a copy of this on the weekend, I was happy to see your enthusiastic response to it! I haven't read anything by King since The Dome, which was FANTASTIC. Like this one, crazy long but I could hardly put it down even when it was time for me to go to work. (Reading the book will always be tied, in my memory, to laying inches in front of my space heater, desperately trying to delay all coffee visits and work until I'd finished reading.) I don't know why I'm taking so long to get around to 11/22/63, but you do a good job selling it. I have about 8 hours of bus rides ahead of me tomorrow, so maybe it's time I finally take the plunge. Also, I'm really happy that you enjoyed your intro to King so much! I read some of his work in high school, then babyishly decided that he was too low-brow for me, before reading Salem's Lot a few years ago and coming back around to loving him. He's definitely one of the best writers around now - not just one of the best popular writers, but one of the best, period. I meant UNDER THE DOME. doh! Between your review and Sandy's this one is getting bumped way up the list. I can't wait to read it! Yes! Happy to hear your bumping it up. I don't think you'll be disappointed. Thanks Laura! I am quite interested in The Dark Tower series I heard great things about that one. I've just found your blog today, and am now following. I also just bought this book today second-hand, after reading so many good reviews. Can't wait to read it. I ended up listening to this one, and completely loving it! My experience with King is fairly limited (though I'm pretty sure I saw him in a restaurant in Boston one time! ), but there's one thing that's for sure -- the man knows how to research and write!